To catch the attention of operators who have removed their beltpack and headset, a call alert signal is sent by pressing the red 'Call' button. This produces a combination of 20kHz tone and a DC signal to trigger the call lights on all user stations and outstations on a chosen circuit. DC call signalling has been retained for compatibility with previous Tecpro designs. When a call alert signal is received on the intercom circuit, the 'Mic select' and 'Call' buttons flash brightly to attract attention. For increased visibility, Series 2 beltpacks have a mimic LED on their base so the call alert may be seen from most angles. A 'Call' send/receive confidence tone is also heard in the headset. This may be muted by pressing a combination of buttons on the beltpack. Fully compatible with older Tecpro designs. Series 2 power supplies are protected against short circuit and over-temperature. 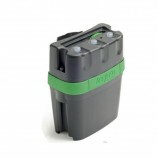 Protection is electronic and automatic and no resetting is necessary following removal of a fault condition. This new generation of PSU can be operated world-wide without the need to change AC power supply settings. The PS753 is similar but offers three independent intercom circuits which may be linked to create either one or two circuits. It is suitable for smaller theatres and rental companies who may need separate circuits to allow members of the sound crew, for example, to talk together without overhearing the lighting crew and vice versa. 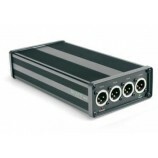 User stations are linked to the unit via three male XLR connectors (one per circuit). Two yellow LEDs indicate circuit linking. If there is a need for a director to talk to operators on more than one intercom circuit either separately or together, then a Tecpro Master Station should be considered. Very robust construction, terminated with an XLR 4-pin connector. 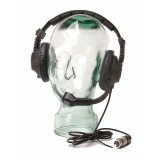 The SMH210 headset is suitable for use with the BP511, BP523 and BP525 beltpacks and offers a wide, smooth response for reduced listening fatigue. Suitable for use with Series 1 and Series 2 products. 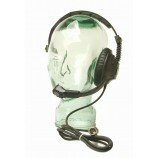 Double muff, heavy duty closed-cup type with a fixed, flexible moulded boom-arm, housing a noise cancelling dynamic mic. Very robust construction, terminated with an XLR 4-pin connector. The DMH220 headset is suitable for use with the BP511, BP523 and BP525 beltpacks and offers a wide, smooth response for reduced listening fatigue. Suitable for use with Series 1 and Series 2 products.